From the mid 1980s until 2003, Aberystwyth Arts Centre established Ceramic Series, a programme of small displays featuring contemporary makers working in the UK, and particularly focusing on those who practiced in Wales. These one-person shows were accompanied by a commissioned piece of writing written by experts in the ceramic field such as Emmanuel Cooper, Phil Rogers and Moira Vincentelli. These published articles were available to the public in both Welsh and English. 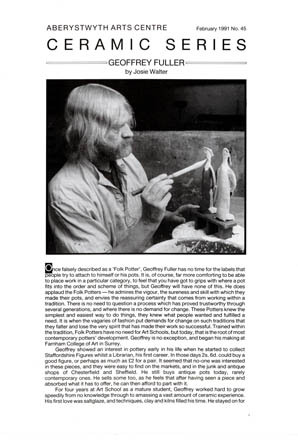 Each issue was around 1200 words and included images of the artist and their work. These are available here in a A-Z list of makers, as PDF documents that you can download and use for research purposes only. Please select a name from the list and double click to open the document. Adams, Billy (1991) by Woodley, Frances. Allen, Daniel (1998) by Milton, Maud. Asenbryl, Oldrich (1984) by Course, Stephen. Atherley,Katherine (1993) by Patrick, Neil. BardonMill Pottery (c1983) by unknown. Batterham,Richard (1988) by Cooper, Emmanuel. Bell-Hughes,Beverley (1984) by Tyler, Sheila. Bell-Hughes,Terry (c1983) by Rogers, Phillip. Bennett,Mary (c1983) by Briers, David. Blackwell,John (2003) by Rowbottom, Paul. Bond,Geoff (c1982) by Briers, David. Bowen,Clive (c1982) by Briers, David. Britton,Alison (1996) by Illsley, Brian. Brown,Sandy (c1983) by Briers, David. Bunting,Bunting (1998) by Dahn, Jo. Caiger-Smith,Alan (1984) by Briers, David. Campbell,James (1999) by Hooley, Lindsey. Carter,Willy (1992) by Walter, Josie. Casson, Michael and Sheila (1997) by Whiting, David. Constant, Christine (1994) by Brown, Stephanie. Cooper,Bennett (1998) by Cooper, Emmanuel. Cooper,Emmanuel (1992) by Lucie-Smith, Edward. Crowley, Jill (c1983) by Briers, David. Curneen,Claire (1998) by Cooper, Emmanuel. Davies, Clive (1990) by Muir, Mary. El’Nigoumi, Siddiq (c1983) by Vincentelli, Moira. Finch,Joe (1996) by Dahn, Jo. Flynn,Michael (1992) by Greenhalgh, Paul. Francis,Mike (c1986) by Briers, David. Frith,David (c1982) by Cooper, Emmanuel. Fuller,Geoffrey (1991) by Walter, Josie. Gibson,John (1990) by Walter, Josie. Gregory,Ian (1996) by Rogers, Phil. Halls,Susan (1993) by Cooper, Emmanuel. Hamlyn,Jane (1984) by Shrimpton, Sally. Harrison,Steve (1999) by Cooper, Emmanuel. Hearne,Martin (1994) by Cooper, Emmanuel. Henderson,Ewen (c1985) by Harrod, Tanya. Howell,Catrin (1995) by James, Sarah. JamesJeremy (1993) By Dormer, Pete. Keeler,Madoline (1991) by Casson, Mick. Koch,Gabriele (1997) by de Waal, Edmund. Landreau,Jean-Paul (1996) by Cooper, Emmanuel. Lane,Peter (1997) by Whyman, Corline. Leach,Janet (1990) by Cooper, Emmanuel. Lewenstein,Eileen (1992) by Harrod, Tanya. MacCarthy,Sophie (1990) by Briers, David. Mallalieu,Finella (1997) by Whiting, David. Malone,Kate (1989) by Cooper, Emmanuel. McGarva,Andrew (c1983) by Cooper, Emmanuel. McGarva,Andrew (1994) by Cooper, Emmanuel. 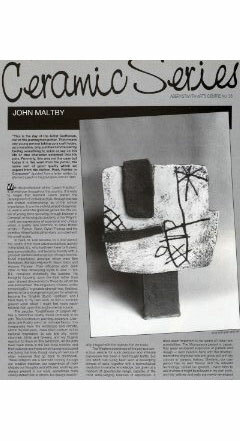 Mullin,John (1993) by Mann, Bob. Myers,Emily (1992) by Whiting, David. NewWelsh Ceramics (1995) by Rogers, Phil. Noel,Anna and Sarah (1983) by Briers, David. Pearson,Colin (1996) by Whiting, David. Perryman,Jane (1990) by Lewenstein, Eileen. Phillips,Anthony (1983) by Cooper, Emmanuel. Pickard,Nancy (1995) by Aithie, Patricia. Pollex,John (1992) by Brown, Sandy . Poncelet,Jaqui (c1982) by Briers, David. Pretsell,Philomena (1997) by Vincentelli, Moira. Robertson,Sarah (2000) by Aylieff, Felicity. Robinson,Anne-Marie (1994) by Spence, Gerda. Rogers,Phil (c1982) by Briers, David. Rogers,Phil (1995) by Whiting, David. Salmon,Antonio (1993) by Whiting, David. Schloessingk,Micki (1994) by Nuttgens, John. Slee,Richard (1991) by Houston, John. Smith,Peter (c1983) by Smith, Peter. Spacey,Charles (1995) by Heeney, Gwen. Still,Gillian (1989) by Vincentelli, Moira. Swindell,Geoffrey (c1984) by Vincentelli, Moira. Tchalenko,Janice (c1982) by Cooper, Emmanuel. Teuteberg,Sabina (c1985) by Briers, David. Tudball,Ruthanne (1992) by Cooper, Emmanuel. Walter,Josie (1992) by Rogers, Phil. Wason,Jason (1993) by Vincent, Paul. Wells,Meri and Mattison, Steve (1995) by Piercy, Jill. White,Tony (1999) by Dahn, Jo. Whiteside,Zoe (1998) by Cooper, Emmanuel. Williams-Ellis,Bronwyn (1991) by Tyler, Sheila. Winterburn,Mollie (1989) by Briers, David. Young,Andrew and Joanna (c1984) by Taylor, Barbara. Young,Mary Rose (1990) by Briers, David.